Hi, we have a preview of build 145 now available on auto-update. This is great! Thanks for adding Bleed to document setup! Many great improvements all around, look forward to testing it. and it's on the autoupdate on Mac OS. Downloaded and installed with no issues. Really enjoying this beta! Lovely ... thank you team. I particularly like the option to choose the number of pages when creating a new document. Auto update worked like it should. On Mac. Bleed in new doc - yes! Is there a way to get such text to be added to a text frame automatically when the text is continued in a linked text box on a different page? There should also be a matching "Previous Frame Page Number" and ability to add text to top of linked text boxes when the text is continued from a box on a different page ("...continued from page ..."). How many builds do you think we are before gold master? There’s a way to go yet. I hope you see that as good news! V. 145 updated perfectly from v. 140. All previous settings, preferences, docked panels, and default font settings right there where they should be. I opened several files, fiddled with them, and saved. All perfect. Thank you!!! No. It's something we'll add one day (PagePlus has it) but probably not for the first release. Great to see that the Publisher Beta is improving. My main problem at present is that I cannot start working if I cannot create Masters with editable placeholders. I hope this is a priority with the team. Thanks! Bleed export is looking great now! And love the new document creation having all the settings upfront - so much better!! Thank you for all the great work on Publisher, this is really looking terrific!! Hello @AdamW thank you for this great update version, just finished the download now after it failed 3 times. it's installed now and i'm ready to test-drive it and will surely come back here with inputs. I haven't played much to date - but opened the first beta document I tried - this opened fine and seems to have everything I created the first time. The document has base line grid a multi column text box filled with "Filler Text". I was going to try out some paragraph styles on this and found that I can't place the cursor within this text - only at the start or the end. This isn't really a bug as it seems that this filler text can keep filling a text box as I expand or contract it, so it seems a deliberate feature. However when I am developing a design document I liek to play with some text and set up some paragraph styles for body copy, headings, etc to test out - I might do this with real text - but also with dummy text. With the automatic "Filler Text" option I can't select any text within this to create or apply styles. My other option would be to grab some text from Lipsum.com (or some other personal standby text) to actually start playing with and developing styles. Not sure what other people do - but I think I prefer filler text to be editable. I'm not sure having the filler text automatically refilling a text box is as useful to me as being able to develop styles. Usually I have found that if I have made a text box bigger, or linking through to other text boxes, I just add more "Fill text" to fill up the empty space that is left. Select the text frame then go to menu Text ▸ Expand ▸ Expand Field. You should then be able to select the text/paragraphs as you intended. Note the text will not fill that text frame anymore if you extend it. I am exporting to PDF but everything is rasterized. Am I doing something wrong or how do I prevent vector objects and fonts from being vectorized? And: What exactly is „everything“? Well, it only detects the NEXT page, not the actual marker of a page of a jumped/continued story. 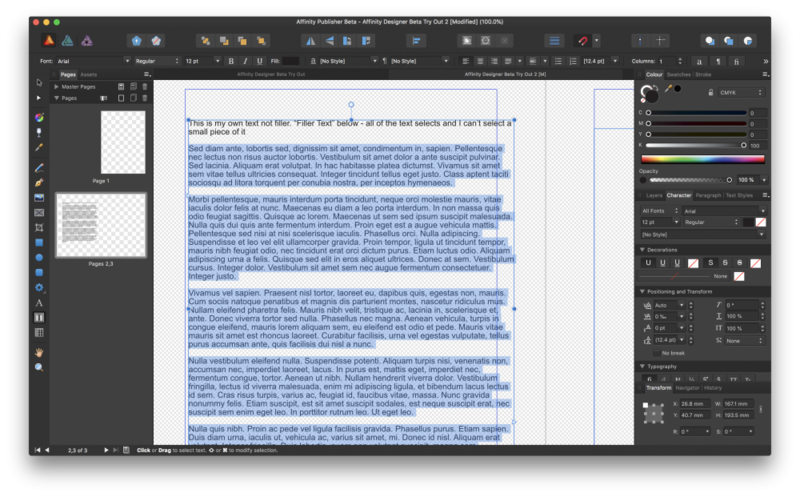 QuarkXpress have this 'Next Box Page #' marker as it detects the actual page of the continued story, and 'Previous Box Page #' marker, where the story of the page first started or it's like 'Continued from Page #. Same goes to InDesign's 'Next Page Number' and 'Previous Page Number' marker. I wish Publisher have this feature.